Hazelhurst Regional Gallery & Art Centre’s 2016 partnership exhibition project with the artists and art centres of the Anangu Pitjantjatjara Yankunyjatjara (APY) Lands, South Australia, has won a MGNSW IMAGinE Award (Exhibition Project – Galleries 3-10 paid staff). Nganampa Kililpil: OUR STARS (15 October – 11 December 2016) was the first major survey exhibition from the artists of the APY Lands of central Australia. The Lands are home to some of the best known and most innovative Indigenous artists in Australia. Earlier this year Hazelhurst also received a National Award for Local Government – Promoting Indigenous Recognition for the OUR STARS project and were highly commended in the Museums & Galleries National Awards (Museums Australia) – Temporary Exhibitions Category. 2018 will bring another exciting collaboration between Hazelhurst and the APY Lands artists with the landmark exhibition, Weapons for the Soldier, curated by artists Robert Fielding (Mimili Maku, Mimili), Vincent Namatjira (Iwantja Arts, Indulkana) and Anwar Young (Tjala Arts, Amata). Image: Installation of Nganampa Kililpil: OUR STARS – Art from the Anangu Pitjantjatjara Yankunyjatjara (APY) Lands, Hazelhurst Regional Gallery & Arts Centre, 2016. silversalt photography. Celebrate Nganampa Kililpil: Our Stars after hours with an exciting line up of festivities. Come along and hear the soulful tunes of DJ ReWild (Emily Nichol), host of Making Tracks on Koori Radio, while enjoing food and bar service. Contribute to the public artwork of mapping Sutherland Shire or join in with family art making activities including origami constellations, incredible aerial artworks and beautiful tjanpi tree sculptures. 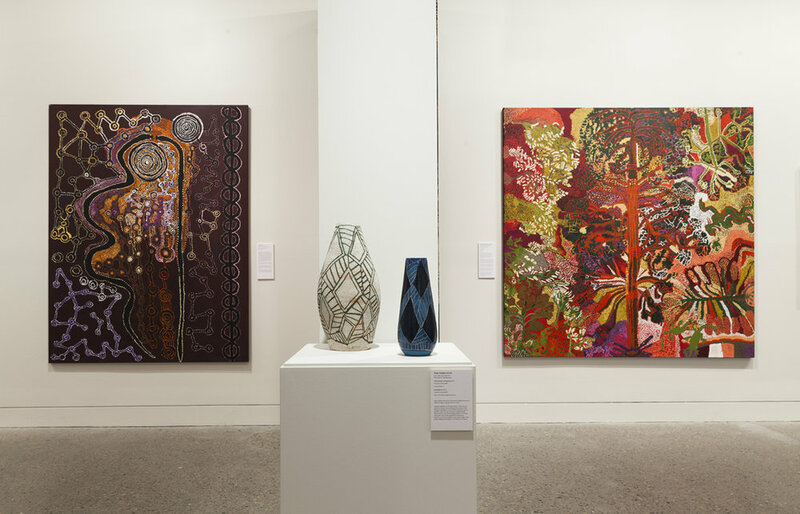 Listen to Art Talks including Robert Fuller, from UNSW speaking on The Euahlayi Technique of Navigation by Teaching with Star Maps, hear Rudi Bremer talk on an engaging panel discussion, or simply enjoy the incredible artwork from the APY Lands. Banner image: Wawirya Burton and Kunmanara (Ruby Tjungawa) Williamson, Ngayuku Ngura, My Country, 2014 (detail), Maclean Collection.